I should start by setting the scene in Bergen. 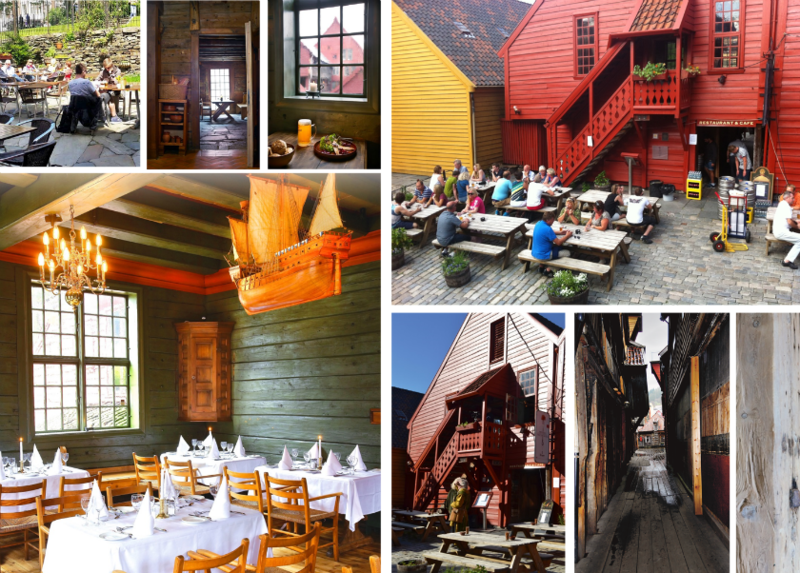 Easily the most recognisable attraction in Bergen is Bryggen, the old wharf that is now a Unesco World Heritage site. The long buildings on the wharf teeter on odd angles, with long outdoor corridors running between them. The wharf is heaving with tourists during the day, many of whom come in on the cruise ships for the day. By the evening, the wharf was quiet once more, and we were able to truly soak in the atmosphere of this historical place without having to actively avoid photobombing hordes of tourists. Bryggen Tracteursted is a very quaint, low ceiling, old style Bergen building within the wharf itself. Footsteps from the kitchen staff above can be heard through the old wooden beams. There’s also a large outdoor area for those (rare) sunny Bergen days. You would be forgiven for thinking this restaurant existed solely for the tourists with the location and aesthetic, but this is absolutely not the case at all! Bryggen Tracteursted have ensured that this restaurant is quality, regardless of the location (and what a location it is). You have the option to opt for the a-la carte menu, or choose from a selection of smaller plates; a kind of ‘Norwegian Tapas’, if you will. We LOVE to taste everything so it was a no brainer – we went with the tapas option. The plates are small, but priced well for Norwegian standards especially considering the location. So, when you think of Norwegian cuisine, what comes to mind? Salmon, trout, roe, whale? We didn’t want to eat only a selection of seafood, however these all feature prominently on the menu. The three plates we went for were aquavit cured smoked salmon, which was served with scrambled eggs. Aquavit is Scandinavia’s liquor of choice – with a very sharp taste and quite a kick! With the price of alcohol in Norway, making one’s own moonshine is still a very popular activity (perhaps a necessity, depending on the way you look at it), so it’s no surprise that their national alcohol would be something so potent! The aquavit taste was very subtle though, and really released the other flavours of the salmon. Smoked whale was the second dish. After regretting not trying it in Iceland some years ago, there was no way it was getting passed up again this time! To be honest, there wasn’t a huge amount of flavour, although it was complemented well by the celery mayonnaise that accompanied it. But still definitely worth trying if you have the opportunity! The smoked lamb – cured and salted – was the show stopper for us. As an Aussie, lamb is something I know well (perhaps not as intimately as the Kiwi’s..) and I can categorically say that this was *good* lamb. A good portion of it too! To finish, although we saw delicious looking berry and cream dessert being ordered on other tables, the cheese board with nut bread and spiced plums took our fancy to finish a delicious meal with a selection of Norwegian cheeses. Slowly savouring every mouthful. Staff were sweet and friendly, very attentive, chatty, and all spoke perfect English (like many Norwegians in the larger cities). This is definitely not just a tourist trap – and if I ever find myself back in Bergen it would be a no-brainer to revisit and try some of the other items on the menu!